Onion root maggot flies are rather delicate, hump-backed gray-brown flies, about 5-7 mm long. Onion, seedcorn and cabbage maggot flies are difficult to distinguish with the naked eye, but each will only be found on and near their appropriate crop family. Onion maggots spend the winter as small brown pupae in the soil. Adults emerge in spring and can travel up to one mile in search of host plants. A good indicator of the start of root maggot flight is blooming of the common roadside weed, yellow rocket. Female flies seek out their host crop to lay eggs at the base of the stem. Cool, moist soil conditions favor survival of the eggs, and soil temperatures over 95°F in the top ½ to 1 inch kill them. There are three generations each year in New England. When eggs hatch, larvae feed on roots and can cause complete destruction of the root system. In onions, newly hatched larvae crawl behind the leaf sheath and enter the bulb, and feed on the roots, stem, and developing bulb. Feeding damage also encourages entry of soft rot pathogens. Flies are attracted to bright yellow colors. Yellow sticky cards (3X5 inches) are inexpensive and easy to use; attach them with small wire stakes and place near the soil. Check and change traps twice weekly to record changes in fly activity (sources: Great Lakes IPM, Gemplers). 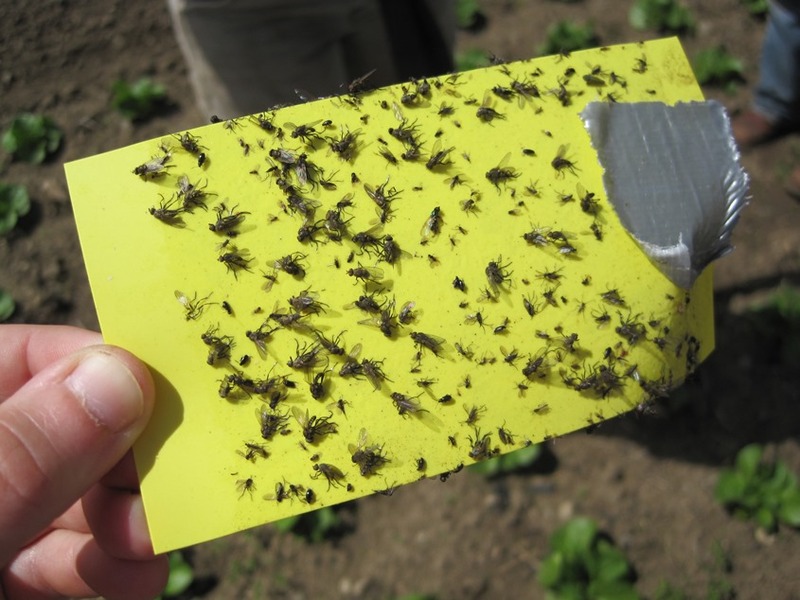 Cumulative growing degree days (GDD) can be used to monitor the activity of onion maggot fly in your area. Many GDD models are base 50°C, but because onion root maggots are active at lower temperatures, GDD models should be base 4°C. NEWA has onion maggot models and growing degree day information here. Choose your state and the weather station closest to you. The resulting report indicates daily and cumulative GDD using the base temperature 4°C. There is also GDD forecasting functions on the NEWA site for Connecticut, Massachusetts, and New York. Find a station near you and look at the last column for 4°C base T. You will see daily GDD forecasts for the coming week. This may be useful for determining whether pre-treatment or post-treatment would be most effective for your transplants. 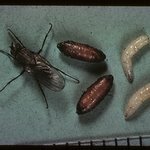 Although cabbage root maggot, onion root maggot, and seedcorn maggot flies look almost identical, the peak flight for each pest occurs at different GDDs. Rotate crops to keep maggot populations low; greater distances are more effective. Delay planting until after first flight is finished and soil temperatures are high enough to kill eggs (95°F). Planting in late-May is more likely to be safer than the first half of May. Cover recently seeded or transplanted crops with floating row covers as a barrier against cabbage root maggot flies. Place the cover as soon as the transplants are set. Do not use where brassicas were grown last year, as pupae left in the soil could emerge under the cover. Place cover over the crop at the time of seeding or transplanting and seal the edges with soil. Replace cover after weeding operations. As soil temperatures rise, first flight ends, and crops grow large, covers can be safely removed. Use production methods that favor vigorous growth so that plants can compensate and outgrow moderate amounts of root injury. For information on production methods, visit the New England Vegetable Management Guide website. Minimize mechanical and chemical damage to onions througout the season. Gather culled bulbs into deep piles as opposed to deep plowing or harrowing after harvest. This will limit fly reproduction to the surface layers of the cull pile and will reduce populations more than tilling under. If harrowing after harvest, wait until frost to limit bulb damage and winter survival. Bury or haul away cull piles. Fungi. Naturally-occurring fungal diseases occasionally will reduce onion maggot numbers significantly, particularly when flies are abundant and relative humidity is high. During a fungal epidemic dead, diseased flies can be seen clinging tothe highest parts of plants along field edges. Beetles. Predaceous ground beetles which eat onion maggot eggs, larvae and pupae can also be important in reducing maggot numbers. Because these soil-inhabiting beetles are susceptible to insecticides, broadcast soil insecticide treatments should be avoided whenever possible. Nematodes. Soil application of the entomopathogenic nematode Steinernema feltiae has shown efficacy against cabbage maggot in trials even at low soil temperatures 50°F/10°C) Apply by suspending infective juvenile nematodes in water and treating transplants prior to setting in the field (as a spray or soaking drench), or in transplant water used in the water wheel transplanter, as a drench after transplanting, or a combination of pre-plant and post-plant applications. Post-plant treatments are likely to be needed if maggot flight begins >1 week after transplanting. Rates of 100,000 to 125,000 infective juveniles per transplant have been shown to be needed to achieve reduction in damage. Nematodes need a moist soil environment to survive. Direct application of insecticides to the root zone is considered the most effective means for controlling maggot damage. Insecticides should be applied as a narrow band with enough water to penetrate the root zone. For direct seeded crops, apply insecticides over the row. For transplanted crops, spray should be directed to the base of the plant. A wider spray band reduces the concentration of the insecticide over the row and therefore decreases its effectiveness. Some materials may be applied as a transplant tray drench or in transplant water, or in-furrow before or during seeding or transplanting. Be sure to read the label of any material you choose to use to determine which methods it is labeled for. Scout each successive seeding or planting to determine whether treatment is required. Onion maggot eggs are very sensitive to high soil temperatures (above 95°F), and will die if they are exposed to these temperatures for several days in a row. Generally these soil temperatures are reached by late May/early June, unless there has been excessive rain, which has a dramatic cooling effect on the soil. This means that under high soil temperatures there is no need to spray for this pest. Check labels for specific crops allowed and other restrictions, including options for soil drench in direct-seeded and transplanted crops and transplant drench. Target the seed furrow or the base of the plants after transplanting, and use at least 100-200 gallons of water per acre to help the insecticide penetrate to the root zone. For more information on chemical management of this pest, please visit the New England Vegetable Management Guide website.